What timing. On the precise day that an extension of the Patriot Act was to be debated in the Senate, the New York Times chooses that moment to release a story they sat on for a year, headlined with the provocative title, Bush Lets U.S. Spy on Callers Without Courts, written by James Risen and Eric Lichtblau. The NY Times and such boosters in mainstream media (notably NPR) harp on how “patriotic” is the Grey Lady, willingly keeping this story under wraps in the interest of national security, at the request of the Bush White House. What bilge. Couldn’t have had anything to do with the timing, whereby the NY Times has a partisan interest in affecting the vote on a Patriot Act extension. No connection to the pending release of Risen’s book, detailing the “secret” war on terror (from which this article (turns out) is an excerpt. And the reporting. Reading the NY Times, it takes 5 full pages of the online version to glean the details of precisely how and where and with what target President Bush signed executive orders. These orders allowed the NSA to pursue specific, selected individuals when and only when direct evidence of intercepted communications with known terrorist entities include links to domestic sources (American citizens or otherwise). The Times hypes this as affecting “hundreds, perhaps thousands” of American citizens over a three to four year period, later reports suggest 37 instances. Damned if you do, surely damned when you don’t. The 9/11 Commission and screaming headlines at papers like the Times made much of less than a dozen vague NSA intercepts that would seem to suggest a forewarning of an impending attack immediately before 9/11 (without any operational or target details of course). “They didn’t act!” the story line went at the time. Enough commentary. How about some background on actual intelligence gathering and privacy protections that reflect reality, rather than the fevered imaginings of Pinch and the gang, or the ACLU? NSA and its many operations enforce stringent privacy and civil rights protections, guided, remarkably enough, by Presidential Orders. Any interceptor or analyst working for the Agency knows the drill for chance or incidental exposure to U.S. Citizens or any artifact of intelligence gathering that indicates communications involving U.S. Citizens. Immediate steps are taken to purge or sanitize or otherwise destroy any information related to U.S. citizens, and names and identities are redacted in any transcripts. Before someone jumps on this fact as “destroying the evidence,” keep in mind that this takes place at the point of intercept or as soon as identity of citizenship is established, prior to any further analysis or reporting takes place. That, and the infamous “wall of separation,” quite properly imposed in these instances, prevents the Agency from passing any such intercept or intelligence to any law enforcement entities. This was the real reason the wall was established, to prevent intelligence activities to be directed domestically for law enforcement purposes. The cases in point involved the capture of terrorist cell phones and laptops, in which information on terrorist contacts that included U.S. citizens. For those instances where a very strong likelihood or certainty of terrorist complicity existed, the President was prepared to issue an Executive Order allowing the exemption from the regularly defined FISA process. It’s gratifying from an oversight perspective – and perhaps dismaying from a public security standpoint – that such an exemption was so rarely granted. When you start from the premise that the U.S. Government – or more precisely, a Presidential Administration and Congress run by an opposition political party – is the enemy, then partisans like the Times and their collaborators in the Senate can look at both sides of electronic eavesdropping, and damn both yes and no to collect, as the signs of a fascist or incompetent state. When any factual, non-partisan history of the Global War on Terror will ultimately be written, historians may well marvel at the Herculean strength of civil liberty protections, and the deep professionalism with which our Intelligence services exercised such extreme restraint trying to sift mountains of intelligence, in finding the needles of warnings and indicators. UPDATE: Peter Schramm at No Left Turns has more on the timing of the Times piece, as well as highlights from within the Times report, detailing the many ways Congress (including Democrat John Rockefeller) and the FISA court were completely informed of these exemptions (and exceptions) to normal FISA process. FOLLOW-UP: Smash at the Indepundit has an excellent discussion of the harm potentially caused to our National Security, so good in fact that all I need to say is, "he's right." Go read if you haven't already. Via Instapundit, with a hat tip as well to John Hinderaker at Powerline. Buzz Patterson asked to interview me today on his program, The Buzz Cut, on Rightalk.com, scheduled for 1-2:00 pm EST Monday December 19th. Buzz wants me to talk about my impressions from my recent 10 month stint in Iraq and the stunning success of last week's Iraqi Parliamentary elections. Just the fact that the level of debate has gone up, and you have some leaders, Kerry, Pelosi, Dean, saying we can’t win and we’ve got to get out, that’s not reassuring to our troops, that’s not supporting our troops, and what is always lost in this discussion is, by God it’s not reassuring our allies, including the Iraqi leadership. Howard Dean’s casual comment that we can’t win is not just irresponsible, it really is a betrayal of the trust of our men and women in uniform. That’s what makes me so angry about Jack Murtha, more than any of the others, because he was a Vietnam vet, and he did serve many years in the Marine reserve and he ought to know better. Howard Dean, I just have so little regard for his opinion on anything, but he is the leader of the Democrat party, and for him to come out and say that is certainly irresponsible, but even more than that, I think it is harmful to our service men and women, it is a betrayal of their trust, it is very damaging to our allies. The good news story is just shamefully lost where you get somebody like John Murtha saying, we’re not making any progress, and you get someone like Howard Dean saying we can’t win. What is that possibly based on? Because all information on the ground in Iraq refutes that. And by the way, ignoring the feedback from the overwhelming majority of soldiers returning from Iraq? "It’s Electric," declares W. Thomas Smith at National Review Online. I finally see some value in Pajamas Media, running real-time updates and reporting from polling centers in Iraq, check out their Top Stories for today. As always, the best summary of Iraq and other War on Terror news from people who are the “boots on the ground,” and have more than just an “interest” in Iraq, but the investment of their lives and personal safety, over at Mudville. 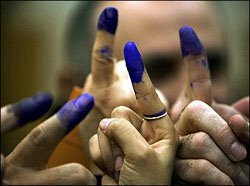 As significant as was the election in January 2005, when Iraqis got to vote on an Interim Government, this election today will be remembered for many years to come. Iraq will never be able to return to the days of Saddam, the Iraqi people will never allow it. They are the Heroes and Heroines of Liberty today. Kurds, Shia, and Sunni. Even holdouts, even Jihadis who chose to vote today, and may well decide to lay down guns and IEDs tomorrow. I do like Smash’s headline better than any on those in his survey of the Western press. And he's right, of course. Now that the Sunnis have thrown their political fates in with a Demcratic Iraqi Government, it will be extremely difficult for them to reverse course. Likewise, Al Qaeda now faces a complete repudiation from the people groups of Iraq. Even former sympatheizers, supporters, and brothers-in-arms will now be their avowed enemies. Al Qaeda is finished in Iraq. Whither next?